Some of the same voices that have been lecturing Democrats about civility are now suggesting that, in order to prevail in the 2018 midterms, they need to follow the example of some European countries and flex their “tough on immigration” muscles by ending the calls to abolish ICE and instead, talk about border security. There are several reasons why that is bad advice. First of all, Richard Cohen warns that if Democrats don’t heed this advice, they will give Donald Trump an opening. The trouble with left-wing Democrats is that they lack a proper respect for right-wing demagoguery. Hence, at the moment, many of them extol socialism — which is to American politics what curling is to sports — and are calling for the abolition of ICE, generously giving President Trump yet another opportunity to demagogue on immigration. They will, if allowed, declaim their way to another defeat. That is pure rubbish. Since when has this president needed an excuse to demagogue an issue? Long before a Democratic socialist won one primary in New York or anyone began talking about abolishing ICE, Trump was constantly lying by suggesting that Democrats want open borders and don’t care about crime. Pretty much everything he says about immigration is a lie. Even the White House twitter account got into the action yesterday when they attacked Sen. Kamala Harris for her call to reform ICE. For this White House, suggesting than an agency that is terrorizing asylum seekers needs to be reformed leads to a claim that you support “the animals of MS-13.” In other words, Trump doesn’t care about the facts related to the actual positions Democrats take, he is willing to demagogue anything. But there’s an even deeper reason why it is useless for the Democrats to calibrate a position on immigration as a way to win over Trump supporters. People who are voting on this issue are not doing so because they have concerns about border security. 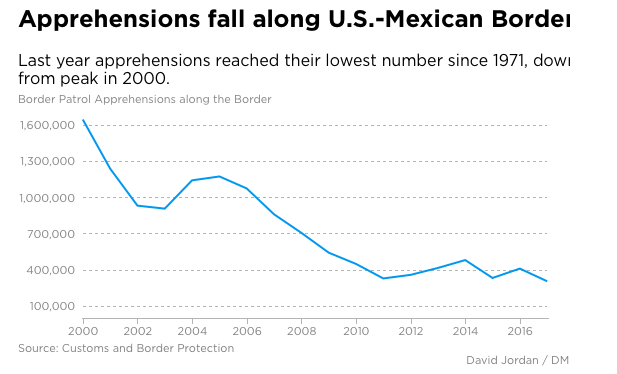 The truth is that illegal immigration across our southern border is at a 40-year low. 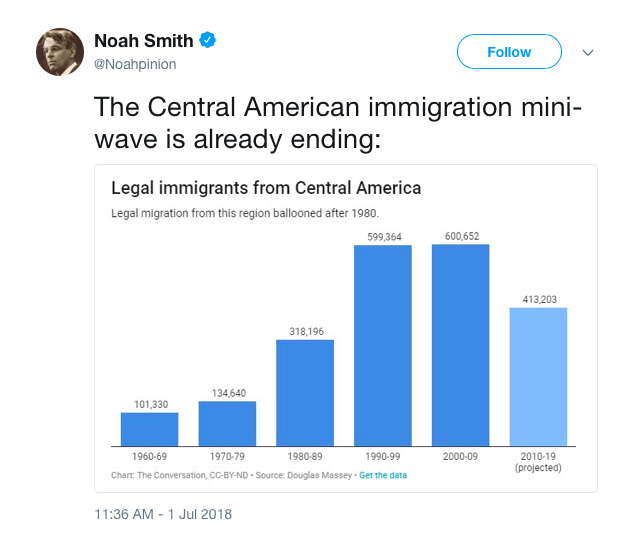 Even the wave of immigrants from Central America is on the wane. 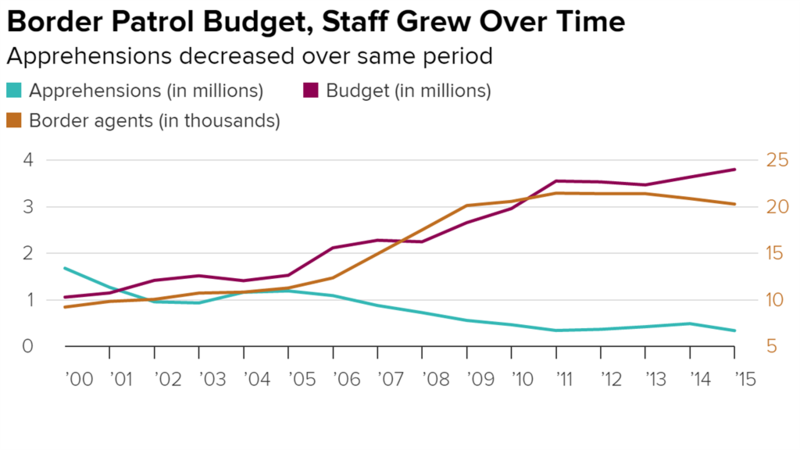 As that number has been dropping, the amount of money and manpower devoted to border security has been on the rise (including a 37 percent budget increase during the Obama years). If the specter of getting tough on immigration and border security were an issue that could help the Democrats politically, it would have already happened. Instead, just as the issue was becoming less severe, the Republican Party got more and more extreme. As I’ve been saying all along, Trump’s entire approach to immigration is based on a lie. Those who support his approach are not being victimized by criminal immigrants or losing their jobs to immigrants or anything else this administration might claim. What is driving this focus on immigration are the demographics that many white people fear because they have tied their understanding of what it means to be American to whiteness. In their minds, when white people become a minority, this country will cease to exist as they have defined it. Nothing is going to change the inevitability of those demographic changes. Even the most regressive immigration policies the Trump administration can dream up will only slow things down a bit. That is why it is impossible for Democrats to come up with a border security policy that can assuage these voters. Pandering to them is not only pointless, it validates the lies this administration is telling.